At the heart of this common rural struggle, and even in the overcrowded cities, water is the staff of life. And there is precious little of it that is clean and readily available. In fact, fewer than 60 per cent of all sub-Saharan Africans (urban and rural dwellers alike) today have access to potable water on a daily basis. Only 30 per cent are supplied with sufficient water for sanitary purposes. Some countries are much more desperate than others. Even a comparatively wealthy country such as Ghana reports that only 15 per cent of its people have ready access to potable water on a daily basis. Malawi, much poorer than Ghana, says only 20 per cent of its inhabitants can rely on clean water. Burkina Faso, Lesotho and Uganda — all relatively developed countries — indicate that only 25 per cent of their citizens have ready access to the kind of water that those in the developed world take for granted. Strangely, because it lags behind most of its neighbours in other developmental aspects, Ethiopia does very well in the water sweepstakes, with 60 per cent of its people having reliable water. Madagascar and Niger, two desperately poor countries, and somewhat wealthier Mozambique, do almost as well. South Africa, the sub-continent’s most advanced country in so many ways, suffers, as well as most of its neighbours, from serious clean-water shortages that promise in coming years to grow much more dire. Sub-Saharan Africa has 677 lakes, including three of the largest and deepest freshwater basins in the world — lakes Victoria, Tanzania and Malawi. It also has a number of great continent-crossing rivers — the Blue and White Niles, the Congo, the Zambezi, the Orange and the Niger plus a plethora of shorter ones such as the Kunene, the Rovuma, the Limpopo, the Luangwa, the Kafue, the Volta and many more. But all of this surface water — and Africa’s agricultural prosperity — depends almost entirely on seasonal rainfalls that are less reliable and less fulfilling than they once were. Global warming and climate change more generally are having a major impact on sub-Saharan Africa’s water supplies, and on water for crops. Only two or three per cent of African agriculture is irrigated. And even irrigation schemes may depend ultimately on rainfall. This year, a serious drought, combined with civil war in the Horn of Africa, has resulted in 20 million Africans becoming malnourished and desperate for water. Two years ago, a serious drought affected most of southern Africa. Droughts across the Sahel, the immediate sub-Saharan line of countries, occur every few years. Rural Africa must depend on arduously drilled or dug wells, hence Ezirazi’s long daily slogs. But underground sources of dependable water supplies are hard to find. And even where river or lake water is close at hand, it is more often than not unclean, having been used as a repository for human and animal waste or because of agricultural and industrial runoffs. Crocodiles also patrol the lake and river shores. Further, even where there is relatively clean and secure surface water, most of sub-Saharan Africa is tropical. Evaporation is rapid. Precious water is lost almost along every step of the way from the time it falls from the sky and the time Ezirazi and her sisters try to collect it in their relatively small jerry cans (which nevertheless often hold 18 kilograms of water, to be carried home on the heads of little girls). Nor is water in the cities easy to find. In some places, there are taps that can be twisted to provide gushing supplies of the precious liquid. But in the heavily populated high-density sections of cities in, say, Nigeria, Kenya or South Africa, piped water is rare. Most households rely on communal water points, or on their own wells (even in major cities). In some desperate cities, such as Harare, the capital of Zimbabwe, the water mains are so old and rusted that they can no longer supply clean water or sometimes any water at all. Harare also long ago ran out of chlorine or other water-purifying chemicals, so its water is particularly unsafe. With the populations in most of sub-Saharan nations growing exponentially, these water shortages will only get worse. Already, Johannesburg and its surrounding provinces import water from Orange River upland sources in mountainous Lesotho. Windhoek, the capital of Namibia, a land of vast desert regions, recycles more than 50 per cent of its urban water through processes that include chemical treatment, aeration and filtration through membranes, and has done so successfully for decades. In Africa’s biggest cities — Lagos and Kinshasa — most water is purchased from roving tanker trucks or on the street, from entrepreneurs selling ubiquitous jerry cans of water (for substantial sums). Boiling water to make it potable might be an easy solution for such problems if fuel were readily available for fires. Filtering water would help, too, but both filters and wood supplies are expensive and hard to find in the urban areas and costly in terms of time to obtain them in the rural areas. Additionally, and possibly most important of all, one government after another has neglected the water problem for 60 or 70 years since independence. In South Africa, the African National Congress-led government says that it simply cannot find the cash to invest in upgrading its failing water infrastructure. Its Department of Water and Environmental Affairs is trying to deal with inadequacy of supply by reducing demand for water by 15 per cent a year. But that is illusory when its population is growing and becoming more demanding. An official of the globe’s largest brewer and South Africa’s major industrial user of water says the problem is that the government has never priced water properly, or tried to collect revenue for water from consumers. Most African countries, barring much smaller and better-run Mauritius and Botswana, are even more water-deprived and badly managed than South Africa. Rwanda has a splendid record in the water and sanitation area, entirely because President Paul Kagame has put political muscle and official money behind improving water sourcing and using that water for sanitary purposes. But, in this area, he is exceptional among African leaders. Fully 55 per cent of Rwanda’s 12 million people now can count on easy access to waterborne sewerage. Hardly any sub-Saharan African nations have solved a water and sanitation crisis that will only become worse as national populations grow and urban populations overrun the already-congested and infrastructure-weak cities of the continent. China is helping to refurbish deficient infrastructures — constructing water plants and water piping systems, sanitary sewers and the rest. 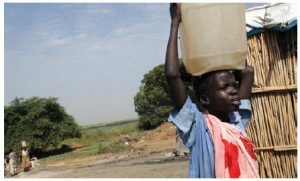 Fixing the water problem is not rocket science, but countries must tap donors or taxpayers for money, and that has so far proved difficult. Unlike Kagame, too few leaders have been aware of problems concerning water. In olden times, it simply dropped out of the sky and was collected. But no longer. 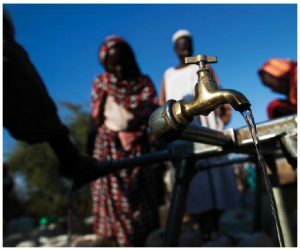 Several international charitable organizations, including the Bill and Melinda Gates Foundation, are active in improving water availability and usage. They seek to provide the leadership and some of the funding that is lacking in Africa. But, unless a great aquifer is located under the Congo or elsewhere in Middle Africa (one was rumoured a few years ago), each cash-strapped African nation must begin to devote more and more resources to this most basic of problems. Otherwise, there will be wars over water, constant shortages and difficulty in sustaining life, much less industry and agriculture. Robert I. Rotberg is a fellow at the Woodrow Wilson International Center, senior fellow at the Centre for International Governance Innovation (CIGI) and founding director of Harvard’s Kennedy School program on intrastate development. His newest book, just-released, is The Corruption Cure: How Citizens and Leaders Can Combat Graft.